It’s snowing in the Midwest and raining (finally, blessed be!) in California. Thanksgiving is behind us and December just around the corner. It’s old hat to say that the year has flown, but—it really did this time! Finding such truisms flying out of my mouth is a real sign of adulthood, I think. But I’ll work on finding more interesting pieces of small talk for this year’s Christmas parties. I was in Chicago for Thanksgiving, and that city already has its holiday lights twinkling, frankly far outpacing San Francisco or Oakland’s attempts at festivity. And I was ready for them: what with the recent wildfires and weeks of bad air in the Bay, the state of American politics and our collective anxiety about it, smartphones and technology and our anxiety about them, poverty, gentrification, the cost of rent, sickness, sorrow and, of course, the complexities of everyday life—well, I am in need of some cheer! It is always this way, is it not? I’m grateful for the moment in the year in which we pause for thanksgiving and giving and gathering and hope, which I firmly believe we all need. Yet everyone is busier and more anxious than ever. And so, it is time to crank on the oven and eat warming foods and reach for a bit of ease. 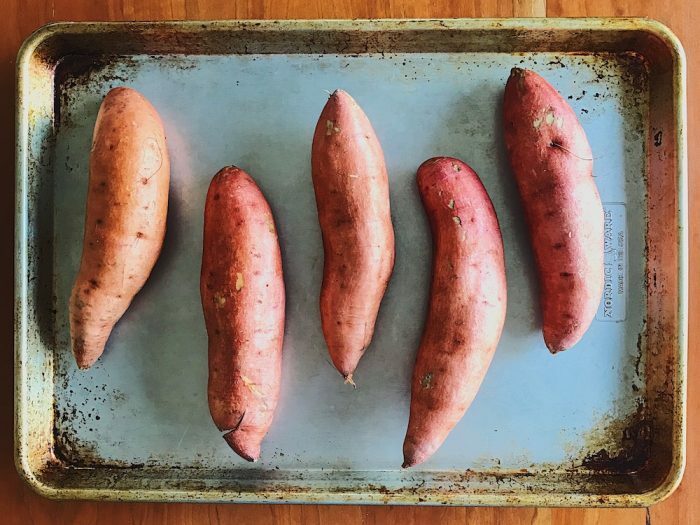 The sweet potato is a fall and winter staple in my kitchen. It’s hearty and delicious and, while hard as a rock when pulled from the ground, just a good scrub and a few steps from being transformed into the centerpiece of a meal. Chock-full of natural sweetness, it doesn’t need all that much from us—just heat and time. Most of my sweet potato preparations are super easy, and many of them begin with the same step. So I thought I’d share that today. 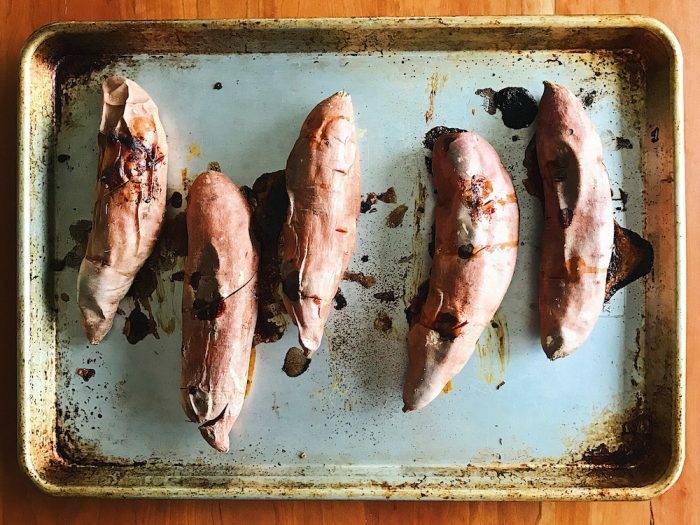 On your day off, just pop a tray of sweet potatoes in the oven to roast, eat some right away and save the rest. You’ll be set up for days of variations on a theme! So pull up a chair, warm your belly and enjoy the season. I generally choose small-to-medium sweet potatoes, which I would quantify as somewhere in the realm of 7 to 11 ounces (about 200 to 300 grams). That’s what I have in mind in the recipes that follow, but these are truly flexible outlines, and worrying about exact ounces would thoroughly defeat our purposes of ease! Preheat the oven to 400 degrees. Wash your sweet potatoes well. Poke each one with a fork or sharp knife several times. Spread the sweet potatoes out on a large pan so they’re not touching. (If you’d like, you can line the pan with aluminum foil to ease cleanup.) No oil or salt needed here! Bake the sweet potatoes until tender, about 1 hour, though this will depend on their size. They should be very soft to the touch, and when you pierce one with a knife, it should go all the way through without any resistance. If your potatoes are different sizes, keep checking on them and remove them one by one as they’re finished. Allow to cool or proceed to a recipe, below. You can keep the cooled sweet potatoes in the refrigerator for several days, in a tightly sealed container. You’ll need about one sweet potato per person for a single hearty bowl of soup each. Boil water or stock, about 1 cup for each sweet potato. Meanwhile, put the sweet potatoes in a powerful blender, skins on. For each serving/potato, add a pinch of salt, a pinch of cumin or paprika (smoked or not), a few shakes of cayenne if you like things spicy, lots of cracked black pepper and a splash (about 1 tablespoon) of apple cider or white wine vinegar. When the liquid boils, pour it into the blender to just cover the sweet potatoes (about 1 cup per potato). Blend the mixture until it’s completely smooth, adding more water or broth if needed. Taste and adjust the salt, spices and acid (vinegar). Blend again, and drizzle in some olive oil, a tablespoon or so per potato. If your potatoes weren’t cold and the liquid was hot, your soup may well be plenty warm. If not, heat it in a pot on the stove. 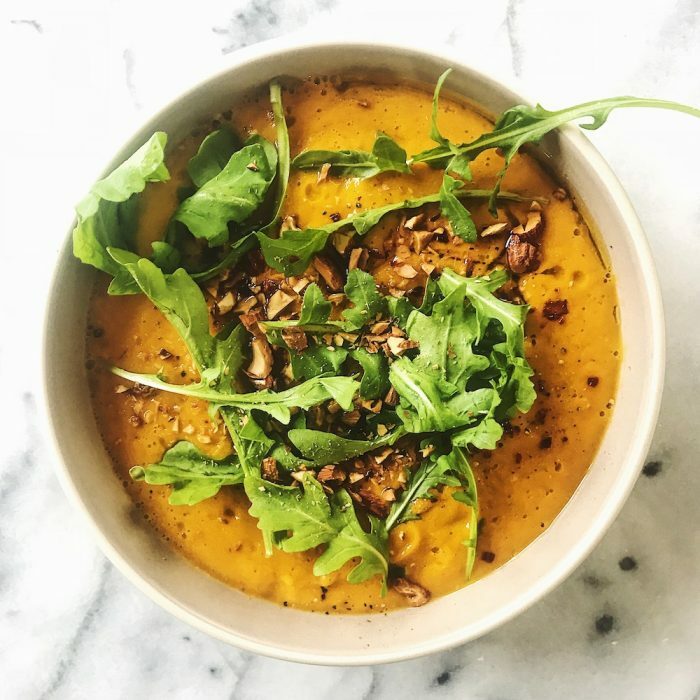 Top bowls of soup with a drizzle each of olive oil and plain yogurt, a little more black pepper, a sprinkle of spice (cumin, paprika or cayenne) and toasted pepitas if you have them on hand. Arugula and herbs like parsley also work well here, as would fried sage. If the sweet potatoes are cold from the fridge, warm them slightly in the oven, toaster oven or microwave. These instructions will yield enough filling for two to four potatoes, depending on how hungry you are and whether there are other dishes on the table. But leftovers will save nicely for a couple of days, too. While the potatoes warm, heat a thin layer of olive or coconut oil in a cast iron or other heavy pan. Add a chopped large leek or onion and a big pinch of salt. Cook until the leek or onion is translucent but not yet browning, then add minced garlic and fresh ginger. Toss in a can of chickpeas (or a couple of cups cooked from scratch) and continue cooking for a few minutes more. Smash the chickpeas slightly with the back of a spoon for texture. Add a small bunch of kale, leaves stripped from the stems and chopped, or several big handfuls of spinach. Cook until the greens wilt. Taste and adjust for salt. Slice the warmed sweet potatoes lengthwise and pile the sautéed vegetable mixture inside and over top. This dish really sings with sauce. Make one with tahini thinned with water and brightened up with lemon juice and zest and a pinch of salt. Or, combine yogurt with a squeeze of lemon, a pinch of salt and a minced or grated clove of garlic. Drizzle the sauce over the potato and finish with Sriracha and/or parsley, if you like. Start with a couple of handfuls of greens per person. Anything will work here, but chicories are a favorite of mine in the fall and winter months. Make a simple dressing of olive oil, red or white wine vinegar and a small spoonful of mustard, whisked well and seasoned to taste with salt and pepper. Toss the greens with the dressing. Slice the sweet potato into cubes. If you have an orange on hand, slice that up as well. On a big platter or individual plates, arrange the greens and top them with the sweet potato and citrus. Add something creamy, like diced avocado or crumbled goat cheese, then something crunchy—any toasted nut or seed will do. Finish with pomegranate seeds if you have them on hand. Use cooled sweet potatoes for this simple salad. One large potato will yield a small salad for two or a single sizable salad. Thinly slice a red onion or shallot and place it in a small bowl along with red wine vinegar and a big pinch of salt. Mix thoroughly, using your hands, and allow the onion or shallot to sit and pickle slightly while you prepare the rest of the salad. Slice the sweet potato crosswise into 1/2-inch rounds. Arrange them on a plate, slightly overlapping. Top with the lightly pickled onion or shallot and drizzle with a bit of the leftover pickling liquid, as well as a generous drizzle of olive oil. Finish with chopped toasted walnuts and crumbled Feta or blue cheese. If you have any microgreens in the crisper, they would be lovely here, as would arugula or soft herbs such as parsley, leaves picked. Start toasting some bread while you prepare the sweet potatoes. Use a thick slab of good bread for the centerpiece of a meal, or opt for thinner slices of baguette for an appetizer or party snack. Toast the bread until lightly browned. Two sweet potatoes will yield about three hearty servings, and leftover mash saves well for a few days. You can leave on the skins, but if they’re loose, feel free to remove and discard some or all for a smoother texture. Cut the sweet potatoes into pieces and place them in a medium bowl. Add a pinch of salt, freshly cracked pepper, a splash of apple cider vinegar or lemon juice and a drizzle of olive oil. Mash to combine, but leave some texture. Roughly chop a big handful of well-toasted almonds. Place in a small bowl with good olive oil to cover, a pinch of salt, freshly cracked pepper and a pinch of Aleppo pepper flakes (optional). When the bread is toasted, rub each piece with the cut side of a halved clove of garlic. Spread a big spoonful of the sweet potato mash over each slice of bread. Top with almonds, the extra olive oil from the bowl, a small handful of arugula and flaky salt. This preparation was inspired by Bon Appétit, which has published a few versions of this technique over the years. These potatoes work nicely in a grain bowl or atop a salad, could take the place of sweet potato fries alongside a sandwich and would make a satisfying side alongside a hearty protein. Plan for about one sweet potato per person. Preheat the oven to 450. Slightly flatten the sweet potatoes with your hand, then tear them into large, irregular pieces. Spread them out on a baking sheet, drizzle with olive oil and sprinkle with salt. Arrange the potatoes skin side down so that they don’t stick to the baking sheet, and spread them out so they don’t steam. Bake for about 20 to 25 minutes, until crisp on the edges and golden brown underneath. Serve hot.